In part 2 of this series, we looked at the differences between the résumé’s Core Competency and LinkedIn’s Skills and Expertise sections. One of the most noticeable difference between the résumé and LinkedIn profile lies in the Summary. Simply copying and pasting your résumé’s Summary to your profile without any further action is poor laziness and cheating yourself of a great opportunity to show your value to visitors and potential employers. As well, this is a great opportunity to tell your story, express your passion for what you do, and show your creativity. Today’s résumé’s Summary is taking on a more concise, yet informative, presence. This is due, in large part, because people who are reading a large volume of résumés value brevity over verbosity. Whereas the LinkedIn Summary grants you 2,000 characters, the résumé’s Summary is usually no longer than 500 characters, preferably shorter. Some believe a Value Proposition should replace the typical Summary. Here is an example of a Value Proposition that immediately states one’s value. Throughout my career, I’ve been hired to increase productivity by at least 50% at companies that required someone who identifies problems and attacks them with an eye on a quick and effective resolution. LinkedIn Summary. The LinkedIn Summary allows you more real estate to tell your story and/or state your immediate accomplishments. It’s your decision whether to enjoy the complete space allowed (my Summary is 10 characters short of the maximum) or be more concise. More creative and personable; remember LinkedIn is for networking and should read almost like a conversation. Be written in first or third person point of view, though first is preferred by most. Written with paragraphs, resembling a story format—or bulleted statements, resembling quantified results and easier to read. May be the only major section fully read by visitors, if your Experience section simply states your title, company information, and dates of employment. I wear a lot of “hats” in the résumé/careers field, having honed my expertise during a long career as a résumé writer, career consultant, speaker, author and trainer. ►EXECUTIVE RÉSUMÉ WRITING – My expertise and my passion! I work with executive clients worldwide, creating highly strategic career-marketing documents that communicate credibility, expertise and value. ►WORLD-CLASS RÉSUMÉ TRAINING – As founder and director of Résumé Writing Academy, I have guided dozens of professionals through a rigorous training and testing program to sharpen their strategic thinking and writing skills. Our students truly EARN the prestigious ACRW designation! Louise continues to use most, if not all, of the 2.000 characters allowed for a profile Summary. The content of this excerpt begins with an overall statement of her career achievements and talks about her accomplishments in her writing and worldwide training. ✔ I have been delivering résumés, job search and career management advice for 27+ years; and LinkedIn profiles and SEO for the last three years. ✔ I’ve helped people get their first jobs after graduation and helped them climb to V.P. level in Fortune 100 companies and now I’m helping their children climb the same ladder of success. If you want better control of your career I can help. ✔ If you are facing career challenges, I write the most effective résumé/LinkedIn profile you could ever own, and I GUARANTEE you’ll get INTERVIEWS IN 30 DAYS. ✔ 80% of companies use LinkedIn to recruit, so your profile needs to tell a convincing story and it must rank high enough in recruiters’ database searches, to be found. I can create a profile that is both credible and visible. ✔ PROVE THIS TO YOURSELF: Do LinkedIn searches for LinkedIn coach, Linkedin profiles, Linkedin profile writer, LinkedIn SEO, LinkedIn writer etc and you’ll find me at the very top in every one. ✔ Do the same test for a variety of résumé writer or career coach terms and you’ll get the same results…. at the very top in every one. Unlike Louise, Martin has a little space left in his Summary, but both Summaries far exceed the character count you’d find in a résumé Summary. One thing for sure is that their Summary style effectively describes their story and expertise. Readers of résumés want quick and easy. Visitors of your LinkedIn profile want a networking document, not a rehash of your résumé. Don’t disappoint the readers and visitors on any count. 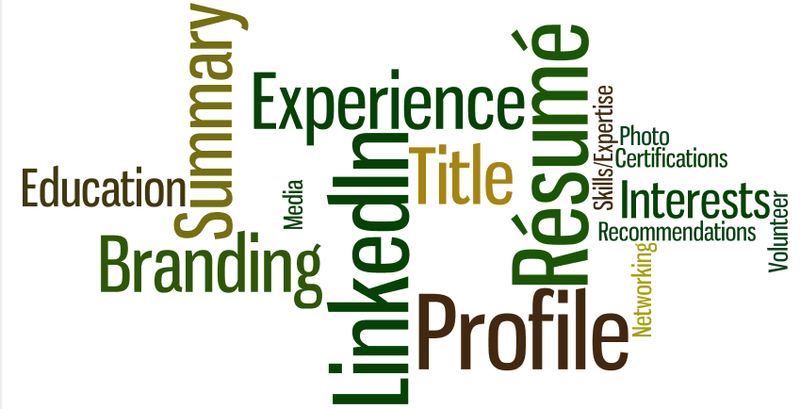 In the next post, we’ll look at the differences between the Experience sections of the résumé and LinkedIn profile. This entry was posted in LinkedIn, Résumé Writing and tagged LinkedIn, LinkedIn summary, resume, Resume Performance Profile on August 20, 2014 by Things Career Related. This series is excellent, Bob – so detailed and full of info. Nice work! myself critiquing LinkedIn sites for clients, daily. Many thanks!